I teach stained glass design and glasspainting to professional artists, children and beginners aged eight to eighty. The stained glass pictured here was all designed, cartooned, cut and painted by students during workshops or artist-in-school residencies with me. 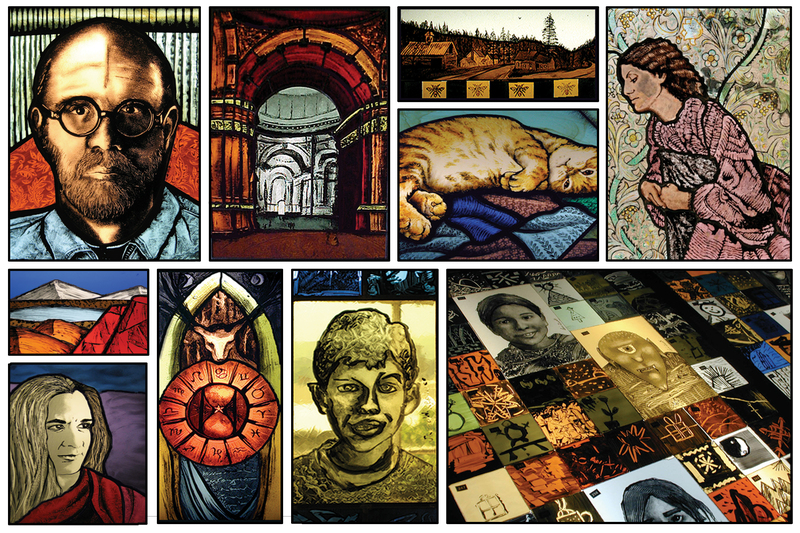 From top left: Clara El Choueri (portrait of Chuck Close); Carol Slovikovski (classical interior); Hallie Monroe (landscape); Tiger Waterman (her cat, Purr); Chantal Pare (after Burne Jones); Phil Ertel (landscape); Kate Grady (portrait); Liza King (untitled); 3rd grader Jacob Keplinger (self portrait); and his friends at Stamford Elementary School in Vermont (painted glass by K-8th grade children on the light table, unleaded). Witam,oglądam i jestem zachwycona!!!!!!! !U nas nie ma takich farb,są jedynie rozpuszczane za pomocą gumy arabskiej.Chciałabym mieszkać bliżej i być na warsztatach……. I wish I could read your message Renata. Is there some way to translate it into English?